Since assumption of the Presidency on June 30, 2016, Rodrigo Duterte’s “War on Drugs” may have killed as many as 12,000 people. 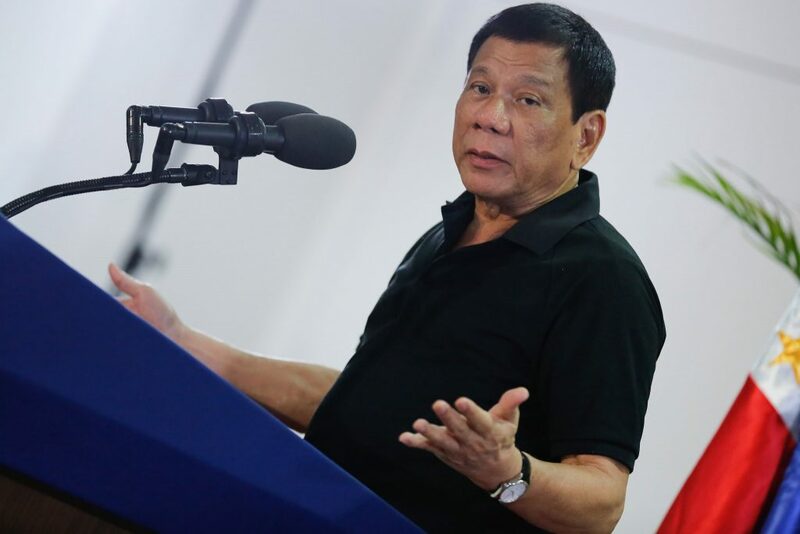 He won the 2016 Philippine presidential election on May 9 explicitly promising to kill millions of criminals, urging people to murder drug addicts, and has consistently argued that the violence of his “War on Drugs” is necessary to prevent the Philippines from becoming a narco-state. One simple graph shows the impact of Duterte’s actions. All the Presidential administrations in the post-Marcos democratic period have significantly lower levels of documented counterinsurgency-related combat deaths, extrajudicial killings and lethal shootings by police. However, there is a huge spike in the first year of the current administration based on even the most conservative estimate of lethal police shootings from the Philippine National Police, specifically of drug personalities, from July 1, 2016 to June 13, 2017. In one year in office, Duterte government has killed nearly three times the number of people the Marcos dictatorship averaged per year. The only problem is, Duterte’s lying. It’s not about drugs. He has framed and deployed violence throughout his terms as Mayor of Davao City, almost unbroken from 1988 to 2016, and as president in the same exact way. The “War on Drugs” is nothing more than a fig leaf for his real goal: political control. He’s still using the same playbook from when he was Davao City’s mayor, ruling through fear as vigilante death squads killed a hundred people a year. The worst part? We’re all falling for it. Duterte’s use of a violent, anti-crime campaign as a pretext for total control is a repeat of his tactics as mayor of Davao City. 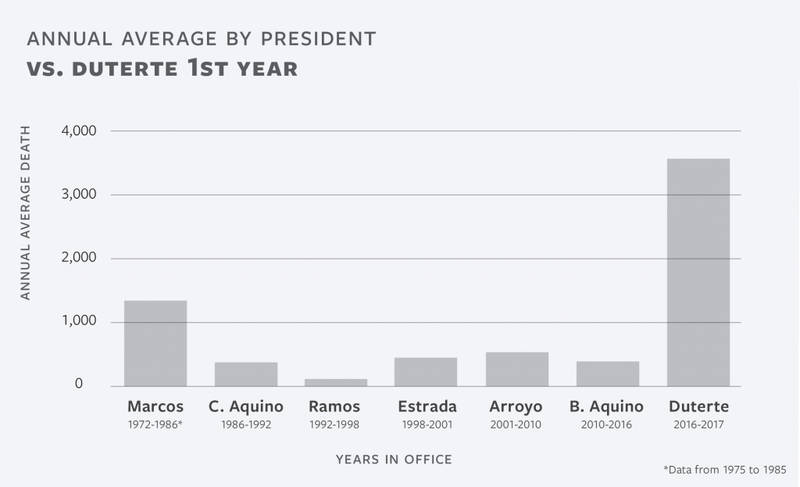 Until winning the presidency last year, since 1988 Duterte was re-elected every three years as mayor, pausing only to serve in Congress (1998-2001) and as his daughter’s vice mayor from (2010-2013) due to legal limits on consecutive terms. Political violence in Davao City initially seems puzzling. The city was one of the most violent places in the country during the period, but did not follow the same patterns as other comparable Philippine cities. Elsewhere, political violence was predictable. It intensified in the months leading to the filing of election candidacies in October and shortly after the May polls, every three years from 2001. The pattern of electoral violence is tied in with processes of building and defending political dynasties. If you can’t persuade, you use violence. Either way, you ensure your candidates run unopposed. However, in Davao City, elections did not produce patterns of bloody rivalry that can be seen elsewhere. Neither did Davao City fit a national pattern of attacks against activists in a counter-insurgency campaign that peaked around 2006 before sharply declining. Why were patterns of political violence different for Davao City? The crucial distinction is that, in Davao City, local political actors used violence to build and maintain political dominance by mimicking casual violence against a fragmented, disorganized urban poor who had no means to fight back. This strategy concealed but amplified state terror under a false “law and order” rhetoric. Davao City thus experienced as much violence as elsewhere, but the violence was used differently. Let’s break down these two important points. First: the city was one of the most violent places in the country during the period, but did not follow the same patterns as other comparable Philippine cities. Over the last two decades, Davao City gained a reputation for being an oasis of stability in conflict-ridden Mindanao, the stage on which protracted Moro and communist insurgencies continue to play. Some even considered it the safest city in the country and the locale received the Philippine presidential award for being the “child-friendliest” city three times. Yet the highest number of violent incidents occur in the Davao region, with Davao City alone making up 45% of the cases in its region and 14% of violence overall (See Figure 2). How do we explain this puzzle? To answer this, I spent much of 2016 digging through data from Commission on Human Rights (CHR) records, daily newspaper archives and NGO reports. I studied cases related to political activities e.g. elections, activism, involving officials or state security forces (military, police, paramilitaries, state-sponsored vigilantes), consisting mostly of killings or attempted killings. I focused on five regions in the Philippines from January 1, 2001 to June 30, 2016: Northern Luzon, Central Luzon, Eastern and Western Visayas, and Davao, where Davao City is located. What sets Davao City apart is the sheer commonness of violence against unaffiliated civilians: individuals who were non-combatants, who had no evident ties to any political faction nor any history of activism. Violence generally peaks around 2006, supporting the assertion among activists, academics and other practitioners that a campaign of state terror, “Operation Plan Bantay Laya” (Freedom Watch), was waged following an exposé that then-president Arroyo may have committed electoral fraud in 2004 (See Figure 3). For example, the periods where the military was active in Central Luzon and Eastern Visayas show pronounced levels of violence, particularly against left-wing activists. Activists, community organizers, journalists and other “enemies of the state” found themselves on military “Orders of Battle”, secret military documents that allegedly listed targets in order of priority for elimination. Military presence also tended to coincide with instances of “casual violence”— essentially, use of disproportionate violence without any specified, strategic purpose. For example, in 2005 in Nueva Ecija, a soldier stationed in the area shot and killed a resident over the latter’s having “blinded” the soldier with his headlights. 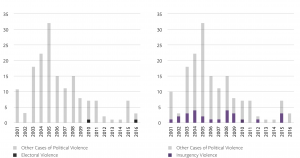 While some elections were more violent than others, violence tended to intensify in the months leading to the filing of candidacies in October and shortly after the May polls, every three years from 2001 (See Figure 4). Assassinations followed a distinct modus operandi: gunmen riding tandem on a motorcycle or a lone gunman making the hit in broad daylight. While some cases were brought before the ombudsman or before the courts (especially those that had victimized mayors, judges, lawyers and activists), the violence was commonly committed with impunity. The police and military’s casual excesses contributed to a pervasive acceptance: people were resigned to state forces’ virtual freedom from accountability. In Davao City, however, the variations in political violence were very different compared to the national pattern and other regions (See Figure 5). Davao City only had a couple of cases of election-related violence within the 15-year period, including one of a village chair from a neighboring town who just happened to be assassinated in the city. 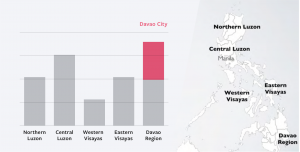 Insurgency-related violence in Davao City also displayed an odd pattern compared to other regions. The number of cases was quite small and generally restricted to outlying rural areas; moreover, unlike other regions, such cases clustered around 2008 rather than 2006 (See Figure 6). For instance, the secretary-general of the peasant union Kilusang Magbubukid ng Pilipinas (KMP) Celso Pojas was gunned down due to his advocacy of farmers’ rights. Leftists had been killed by the military nationwide since 2001; but no leftist leader had been killed in Davao City until Pojas in 2008. What sets Davao City apart is the sheer commonness of violence against unaffiliated civilians: individuals who were non-combatants, who had no evident ties to any political faction nor any history of activism. About a third of all violence against such unaffiliated civilians (32%) among the regions in this study occurred in Davao City and 76% of the victims of violence in Davao City were unaffiliated civilians (see Table 1). Second: in Davao City, local political actors used violence to build and maintain political dominance by mimicking casual violence against a fragmented, disorganized urban poor who have no means to fight back. Davao City has a history of violence. Until the late 80s, many armed paramilitary groups operated there and it was the NPA’s laboratory for urban warfare. While the NPA’s “sparrow” units initially eliminated abusive policemen, soldiers and common criminals, its terror tactics against civilians precipitated the anti-communist, paramilitary Alsa Masa movement. This conflict fueled violence in Davao for decades. From 1988 – 2002, Rodrigo Duterte claimed to have reduced the per capita crime rate to one of the country’s lowest, declaring that he transformed the former “murder capital” into one of the most peaceful cities in the Philippines. But we know that’s not true. We also know that there was very little insurgency-related violence after this period. So what accounts for the shift? A new play on violence for political control. In the course of his tenure, Duterte gained the moniker “The Punisher” or “Dirty Harry” due to his association with vigilante killings attributed to the mysterious Davao Death Squad (DDS) or DDS. The DDS can be linked to as high as 1,424 killings in Davao City from 1998 to 2015. These estimates by Coalition Against Summary Executions, a local NGO, show a rapid acceleration from 2001 onwards, peaking in 2008 with about 180 dead. Moreover, the violence tended to occur in intense “spates” of killings, with multiple vigilante killings in one day over the course of a few days or spread out over a month. In my study, I found around seven such spates of killings attributed to DDS vigilantes were documented. Not all of them were linked to the DDS: for example, a series of lethal police shootings of alleged drug and robbery criminals in April, August and October 2015 were punctuated by Duterte’s public pronouncements against drug criminals. … overt state violence in Davao City disappeared. But in its place was unfettered anti-crime vigilantism, likely to have been orchestrated with the local police. Davao City is, was, and continues to be a violent place. The only difference was who was behind the violence. Fully formed by 1997, the DDS reportedly consisted of former insurgents, paramilitary members and, in some cases, former targets. The hitmen allegedly had handlers among the police and village officials. In earlier years, Duterte used to read lists of criminals on the radio, and within a certain period of time, sometimes as brief as a day or two, some of those on the list would be killed by unidentified gunmen on motorcycles. The lists came from anti-narcotics crime bureaus of the police and intelligence gathered by village officials, but the DDS also began targeting newly-released convicts from prison, individuals with cases pending against them or with a criminal record. In many cases, the targets or their families would learn directly from village officials or through word of mouth that they were “on the list,” prior to the attacks. The targeting of political rivals was rare. Perhaps the most prominent hit attributed to the Davao Death Squad was that of local Radio Ukay broadcaster Juan “Jun” Pala. Pala would frequently lambast Duterte and his “reign of terror” in Davao City on the airwaves. Pala survived assassination attempts in 2001 and April 2003, amid public accusations between him and Duterte for the blame. Pala was shot dead on September 6, 2003. Fast forward to the present: former Davao City senior police officer Arthur Lascañas now claims that the Davao Death Squad exists and, as a longtime and trusted member, he personally witnessed Duterte’s direct involvement. Lascañas furthermore alleges that he himself had been tasked to organize the attempt on Pala’s life and that after Pala was killed, Duterte paid him and his crew PhP 3 million. Overt state violence in Davao City thus disappeared. But in its place was unfettered anti-crime vigilantism, likely to have been orchestrated with the local police. Davao City is, was, and continues to be a violent place. Duterte was responsible for over a thousand dead in Davao City’s streets, without suffering any consequences. Why? Five strategies ensured the success of Duterte’s violent gambit for political control. First, the violence was selective, not indiscriminate: this personalized the threat and strengthened the ability of the local state agents to control dense sections of the urban populace. Similar to the military’s orders of battle, lists of drug criminals were an effective a tarring brush—anyone could be tainted. No documentary evidence of the lists has surfaced so far, yet local knowledge of the lists has been a definitive feature of accounts of DDS violence. However, unlike the activists targeted in political violence elsewhere, the DDS targets in Davao City were mostly unaffiliated with little means to seek redress. Second, as with elections and counter-insurgency campaigns, there were definable periods of high and low intensity over time. The spates of violence intensified the sense of the threat and the immediacy of local power. However, unlike the regularity of election cycles or the concentration of military campaigns around 2006, it is far more difficult to infer immediate explanations for the timing of these spates—that requires further research and evidence. What is clear is that the violence followed a locally-oriented logic, perhaps known only to Duterte and close associates, independent of external or national exigencies. Building directly on his long experience in Davao City, he has learnt from Arroyo’s example not to launch a frontal assault on Philippine democracy but instead attack its vulnerable flank: crime and corruption. Third, the absence of overt election-related violence and marginal incidence of violence related to insurgency-counterinsurgency suggests that Duterte had an effective monopoly over both legitimate and illegitimate use of violence in the territory. Two episodes dramatize this point further. On July 28, 2002, Mohammad Bahnari Ampatuan, the 18-year old son of Mayor Datu Ampatuan and grandson of Maguindanao governor Andal Ampatuan, shot and killed a man named Carlo Asistido. Duterte consequently issued a shoot to kill order against bodyguards of prominent families bearing arms into the city. In March 2010, the bodies of the anti-communist campaigners of former general Jovito Palparan’s political party Bantay, Donald Caigas and Juliana Noquera, were found after the pair were abducted from a local supermarket on March 24. When accused of orchestrating the abduction-killings, Duterte scoffed at the claim saying “What will I gain? People will only sympathize with the party-list group.”  The first case suggests ways in which private armed groups common to local politics were kept at bay; the second highlights the antagonistic relationship Duterte had with military elites. Fourth, unlike any other region or city in this study, political violence in Davao City combined the appearance of casual violence, as a variant of police excessiveness, with the purpose and resources of state violence. This was the strategy for control. In large part, Duterte was so effective because he avoided overt political repression that would have courted backfire from well-organized NGOs and political parties. Instead, he made an oblique attack on an acceptable “foe”: crime. In this manner, a “social cleansing” allowed elites to accommodate death squads as an effective solution, in a way protecting the perpetrators of these killings as they made the city otherwise safe. Fifth, and finally, Duterte’s success also came from his ability to form alliances with national politicians. In 2002, then-president Arroyo threw her political weight behind Duterte and appointed him to head a national consultative taskforce on kidnapping and illegal drugs, endorsing his methods in no uncertain terms. In June 2003, Arroyo launched a national anti-drugs campaign; one of the early spates of DDS killing occurred from May to July that year. Moreover, the estimated DDS killings rise sharply that year from 29 in 2001, the death toll begins to average at about 119 per year until 2005 and continues at similar levels until 2013. Arroyo and Duterte fell out toward the end of her presidency, but he managed to ensure his political succession in Davao City and, restricted by his term limits, successfully ran as his daughter Sarah Duterte’s running mate. The city government’s effective monopolization of both legitimate and illegitimate forms of violence would not have been possible, however, without the larger climate of permissiveness during the Arroyo presidency. Just like other local bosses, Duterte sought to maintain his hold on power and seed a political dynasty that would immunize him from retribution. By his final term as Davao City mayor, he made a first foray into national politics and was successful in his bid for no less than the presidency. His first year in office has clearly shown a strong imprint from his strategies and tactics at the local level. As in Davao City, state violence against the urban poor conceals itself through the guise of vigilantism and police excess. All the while, Duterte has made known that all power concentrated in his hands yet he manages to escape official accountability. As before, his government deploys violence for political control, not against illegal drugs; the rhetoric on drugs is but a fig leaf. The president has mobilized the country’s security apparatus to bring state power to bear on the population. Because suspicion is based on lists of offenders that come from neighborhood and village officials, the threat of violence is personal. With the nightly killings, people are habituated to an excessive use of state force and supposed vigilantism, living in fear. At the top, the efficacy of a purported anti-drugs campaign has been effective in neutralizing opposition. Most notably, Duterte and his allies tarred his most vocal critic in the senate, Leila de Lima, with the same brush of suspected drug-related crime. They have a history, after all: as CHR Chair, De Lima investigated the Davao Death Squad in 2009. Duterte’s purported anti-crime campaign must thus be understood alongside the regime’s attempts to consolidate political control. Building directly on his long experience in Davao City, he has learnt from Arroyo’s example not to launch a frontal assault on Philippine democracy but instead attack its vulnerable flank: crime and corruption. As with right-wing populists elsewhere, Duterte plays on fear and instability to enhance his political power. His strategies for political control in Davao City are key to understanding the on-going violence in the Philippines. Jodesz Gavilan, “CHR: Death Toll in Drug War Higher Than What Gov’t Suggests,” Rappler (2017), https://www.rappler.com/nation/179222-chr-number-drug-war-victims. “Davao City Ranks as 9th Safest in the World,” Philippine Daily Inquirer (2015), http://newsinfo.inquirer.net/690252/davao-city-ranks-as-9th-safest-in-the-world. “Who’s Afraid of General Palparan?,” Philippine Daily Inquirer, October 19 2005. Norman Bordadora, “Left Groups in Orders of Battle, Say Papers,” ibid., June 20 2006. See also “Oplan Bantay Laya: The Us-Arroyo Campaign of Terror and Counterinsurgency in the Philippines,” in Fourth of a Series on State Terror and Human Rights in the Philippines (Quezon City: Ibon Foundation, Inc., 2010). Regional Director Jasmin Navarro-Regino, “CHR Resolution Case No. : III-C-06-2810 Re:Antonio R. Alarcon, Jr for Violation of Art. 3 UDHR and Art. 6 ICCPR,” (Commission on Human Rights, October 3, 2006). In May, Altavista village chair Edison Alisoso was killed and tribal chieftain Emelito Angga wounded in an attack scant days before the election. Inquirer Bureaus, “Security Beefed up in Provinces for Polls,” Philippine Daily Inquirer, May 9 2016. Regional Director Alberto Sipaco, “CHR Resolution Case No. : XI-2008-3041dc Re: Death of Celso Pojas,” (Commission on Human Rights, November 10, 2008). Jeffrey Tupas and Dennis Santos, “Davao Farmer Leader Gunned Down,” Philippine Daily Inquirer, May 16 2008. F.A. Mediansky, “The New People’s Army: A Nation-Wide Insurgency in the Philippines,” Contemporary Southeast Asia 8, no. 1 (1986). Oude Breuil, Brenda Carina, and Ralph Rozema, “Fatal Imaginations: Death Squads in Davao City and Medellin Compared,” Crime, Law and Social Change 52, no. 4 (2009): 415. 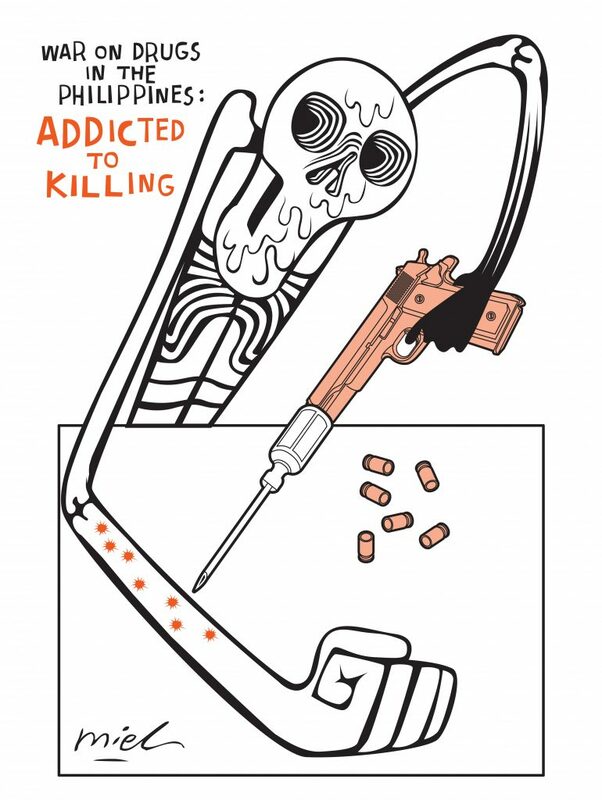 See also Sheila Coronel, “I Will Kill All the Drug Lords: The Making of Rodrigo Duterte,” The Atlantic (2016), https://www.theatlantic.com/international/archive/2016/09/rodrigo-duterte-philippines-manila-drugs-davao/500756/. Breuil, Carina, and Rozema, 415. See, for instance, Phil Zabriskie, “The Punisher,” Time Asia, June 24 2002. Coalition Against Summary Execution, “Data on Summary Executions in Davao City Based on News Clippings from Davao Sunstar, Sunstar Super Balita, Mindanao Times and Brigada Editors from 19 August 1998 to December 2015,” (2015). Unpublished. Seven periods of heightened killings after a lull of a month or more occurred during the following: September to November, 2001; May to July, 2003; February 2004; June to August 2004; December 2004 to January 2005; Mar to April 2006; August 2009. See for instance Germelina Lacorte and Allan Nawal, “‘They Would Have Lost Their Heads’,” Philippine Daily Inquirer, July 18 2015. Allan Nawal, “Davao Drug Suspect Dead after Duterte Ultimatum,” ibid., October 30, 2015. Karlos Manlupig, “Duterte Justice: Robbery, Slay Suspect Dead,” ibid., August 21, 2015. See also Dennis Santos, “2nd Crime Suspect Dead on Heels of Duterte Ultimatum ” ibid., November 1, 2015. “You Can Die Any Time: Death Squad Killings in Mindanao,” (New York: Human Rights Watch, 2009), 49-50. Anthony Allada, “Death Squad Killings,” Philippine Daily Inquirer, May 17 2003. For example, the 2005 killing of Roberto Gonzales, whom police identified as a member of the Akyat Bahay house burglary gang with a criminal record for illegal drugs and robbery. The CHR also noted the similarity of his case to prior DDS killings and that Gonzales’s death may have been one of six such killings that day. Regional Director Alberto Sipaco, “CHR Resolution Case No. : XI-05-2400dc Re: Death of Intong Gonzales ‘Alias Pasmo’ Tn: Roberto Gonzales,” (Commission on Human Rights, September 28, 2006). References to being “on the list” featured in almost half of the Davao City cases that Human Rights Watch had investigated. See “You Can Die Any Time: Death Squad Killings in Mindanao,” 29-46. For example, the case of Jorie Pacana, allegedly a member of the Simpleng Grupo gang in Bankerohan and involved in snatching, extortion and robbery; however, the CHR found no corroborating evidence to substantiate the allegations. “CHR Resolution Case No. : XI-2008-3017dc Re: Case of Pacana, Jorie,” (Commission on Human Rights, July 7, 2008). “CHR Resolution Case No. : XI-05-2397dc Re: Death of Hilario C. Ortega,” (Commission on Human Rights, November 8, 2006). ABS-CBN News, “Lookback: The Assassination of Jun Pala,” ABS-CBN News (2017), http://news.abs-cbn.com/focus/02/24/17/lookback-the-assassination-of-jun-pala. Ayan Mellejor and Anthony Allada, “Anti-Red Leader Wounded in Ambush,” Philippine Daily Inquirer, August 1 2001. Ayan Mellejor, “Duterte Dares Pala to Confront Him on Slay Try,” ibid., May 6 2003. Regional Director Alberto Sipaco, “CHR Resolution Case No. : XI-2008-3019 Do Re: Death of Elvis Española,” (Commission on Human Rights, July 10, 2008). Jodesz Gavilan, “Lascañas’ Affidavit: Duterte’s Roles in Davao Death Squad Killings,” Rappler (2016), https://www.rappler.com/newsbreak/iq/163367-arturo-lascanas-affidavit-rodrigo-duterte-roles-davao-death-squad. Lascañas’s testimony corroborated statements of self-confessed DDS hitman Edgar Matobato at the aforementioned Senate hearing in September 2016. Dharel Placido, “NUJP Wants Probe into Death of Duterte Critic,” ABS-CBN News (2017), http://news.abs-cbn.com/news/02/22/17/nujp-wants-probe-into-death-of-duterte-critic. Audrey Morallo, “Lascañas: Duterte Behind Killing of Jun Pala,” The Philippine Star (2017), http://www.philstar.com/headlines/2017/02/20/1674120/lascanas-duterte-behind-killing-jun-pala. Dennis Santos and Anthony Allada, “Witness Absence Making Vigilante Killings Hard to Solve, Says CHR Exec,” Philippine Daily Inquirer, September 29 2003. On the theory of selective violence, see Stathis Kalyvas, The Logic of Violence in Civil War (Cambridge: Cambridge University Press, 2006). Anthony Allada, Ayan Mellejor, and Dennis Santos, “Scion of Political Family Shoots Dead Davao Resident,” Philippine Daily Inquirer, August 1 2002. Regional Director Alberto Sipaco, “CHR Resolution Case No. : XI-2010-0151dc Re: Case of Donald Caigas and Juliana Noquera,” (Commission on Human Rights, May 20, 2011). Jeffrey Tupas and Dennis Santos, “2 Palparan Campaigners Found Dead,” Philippine Daily Inquirer, April 6 2010. Breuil, Carina, and Rozema, 422. TJ Burgonio and Dona Pazzibugan, “Move over Dirty Harry, Duterte’s Here,” Philippine Daily Inquirer, July 10 2002. Dona Pazzibugan, R. Nazareno, and R. Ponte, “Duterte’s Tough Stance Rubs Off on GMA,” ibid., July 13, 2002. Anthony Allada, “Pushers Fear Davao Death Squad, Surrender,” Philippine Daily Inquirer, July 4 2003. Calculations based on 1998 to 2001 data from Coalition Against Summary Execution. In 2009, Arroyo appointed Duterte’s rival, Prospero Nograles, to replace him on a regional peace and order council and allowed the Commission on Human Rights to investigate the DDS killings. Jeffrey Tupas, “Duterte Gives up City Police Control, Quits Napolcom Post,” Philippine Daily Inquirer, April 1 2009. Christian Esguerra and Leila Salaverria, “Palace Backs CHR Probe,” ibid., March 31, 2009. ABS-CBN News. “Lookback: The Assassination of Jun Pala.” ABS-CBN News (2017). Published electronically February 22. http://news.abs-cbn.com/focus/02/24/17/lookback-the-assassination-of-jun-pala. Alberto Sipaco, Regional Director. “CHR Resolution Case No. : XI-05-2397dc Re: Death of Hilario C. Ortega.” Commission on Human Rights, November 8, 2006.———. “CHR Resolution Case No. : XI-05-2400dc Re: Death of Intong Gonzales Alias “Pasmo” Tn: Roberto Gonzales.” Commission on Human Rights, September 28, 2006.———. “CHR Resolution Case No. : XI-2008-3017dc Re: Case of Pacana, Jorie.” Commission on Human Rights, July 7, 2008. ———. “CHR Resolution Case No. : XI-2008-3019 Do Re: Death of Elvis Española.” Commission on Human Rights, July 10, 2008. ———. “CHR Resolution Case No. : XI-2008-3041dc Re: Death of Celso Pojas.” Commission on Human Rights, November 10, 2008. ———. “CHR Resolution Case No. : XI-2010-0151dc Re: Case of Donald Caigas and Juliana Noquera.” Commission on Human Rights, May 20, 2011.Allada, Anthony. “Death Squad Killings.” Philippine Daily Inquirer, May 17 2003. ———. “Pushers Fear Davao Death Squad, Surrender.” Philippine Daily Inquirer, July 4 2003. Allada, Anthony, Ayan Mellejor, and Dennis Santos. “Scion of Political Family Shoots Dead Davao Resident.” Philippine Daily Inquirer, August 1 2002. Arguillas, Carolyn. “Maguindanao: The Long Shadow of the Ampatuans.” In Democracy at Gunpoint: Election-Related Violence in the Philippines, edited by Yvonne Chua and Luz Rimban. Quezon City: Vera Files Inc., 2011. Bordadora, Norman. “Left Groups in Orders of Battle, Say Papers.” Philippine Daily Inquirer, June 20 2006. Breuil, Oude, Brenda Carina, and Ralph Rozema. “Fatal Imaginations: Death Squads in Davao City and Medellin Compared.” Crime, Law and Social Change 52, no. 4 (2009): 405-24. Burgonio, TJ, and Dona Pazzibugan. “Move over Dirty Harry, Duterte’s Here.” Philippine Daily Inquirer, July 10 2002. Coalition Against Summary Execution. “Data on Summary Executions in Davao City Based on News Clippings from Davao Sunstar, Sunstar Super Balita, Mindanao Times and Brigada Editors from 19 August 1998 to December 2015.” Davao City, 2015. Coronel, Sheila. “I Will Kill All the Drug Lords: The Making of Rodrigo Duterte.” The Atlantic (2016). Published electronically September 20, 2016. https://www.theatlantic.com/international/archive/2016/09/rodrigo-duterte-philippines-manila-drugs-davao/500756/. “Davao City Ranks as 9th Safest in the World.” Philippine Daily Inquirer (2015). Published electronically May 9. http://newsinfo.inquirer.net/690252/davao-city-ranks-as-9th-safest-in-the-world. Esguerra, Christian, and Leila Salaverria. “Palace Backs CHR Probe.” Philippine Daily Inquirer, March 31 2009. Gavilan, Jodesz. “CHR: Death Toll in Drug War Higher Than What Gov’t Suggests.” Rappler (2017). Published electronically August 19, 2017. https://www.rappler.com/nation/179222-chr-number-drug-war-victims. ———. “Lascañas’ Affidavit: Duterte’s Roles in Davao Death Squad Killings.” Rappler (2016). Published electronically March 6. https://www.rappler.com/newsbreak/iq/163367-arturo-lascanas-affidavit-rodrigo-duterte-roles-davao-death-squad. Inquirer Bureaus. “Security Beefed up in Provinces for Polls.” Philippine Daily Inquirer, May 9 2016. Jasmin Navarro-Regino, Regional Director. “CHR Resolution Case No. : III-C-06-2810 Re:Antonio R. Alarcon, Jr for Violation of Art. 3 UDHR and Art. 6 ICCPR.” Commission on Human Rights, October 3, 2006. Kalyvas, Stathis. The Logic of Violence in Civil War. Cambridge: Cambridge University Press, 2006. Kessler, Richard. Rebellion and Repression in the Philippines. New Haven: Yale University Press, 1989. Kreuzer, Peter. “”If They Resist, Kill Them All”: Police Vigilantism in the Philippines.” Frankfurt: Peace Research Institute Frankfurt, 2016. Lacorte, Germelina, and Allan Nawal. “‘They Would Have Lost Their Heads’.” Philippine Daily Inquirer, July 18 2015. Manlupig, Karlos. “Duterte Justice: Robbery, Slay Suspect Dead.” Philippine Daily Inquirer, August 21 2015. Mediansky, F.A. “The New People’s Army: A Nation-Wide Insurgency in the Philippines.” Contemporary Southeast Asia 8, no. 1 (1986): 1-17. Mellejor, Ayan. “Duterte Dares Pala to Confront Him on Slay Try.” Philippine Daily Inquirer, May 6 2003. Mellejor, Ayan, and Anthony Allada. “Anti-Red Leader Wounded in Ambush.” Philippine Daily Inquirer, August 1 2001. Morallo, Audrey. “Lascañas: Duterte Behind Killing of Jun Pala.” The Philippine Star (2017). Published electronically February 20. http://www.philstar.com/headlines/2017/02/20/1674120/lascanas-duterte-behind-killing-jun-pala. Nawal, Allan. “Davao Drug Suspect Dead after Duterte Ultimatum.” Philippine Daily Inquirer, October 30 2015. “Oplan Bantay Laya: The Us-Arroyo Campaign of Terror and Counterinsurgency in the Philippines.” In Fourth of a Series on State Terror and Human Rights in the Philippines. Quezon City: Ibon Foundation, Inc., 2010. Pazzibugan, Dona, R. Nazareno, and R. Ponte. “Duterte’s Tough Stance Rubs Off on GMA.” Philippine Daily Inquirer, July 13 2002. Placido, Dharel. “NUJP Wants Probe into Death of Duterte Critic.” ABS-CBN News (2017). Published electronically February 22. http://news.abs-cbn.com/news/02/22/17/nujp-wants-probe-into-death-of-duterte-critic. Santos, Dennis. “2nd Crime Suspect Dead on Heels of Duterte Ultimatum ” Philippine Daily Inquirer, November 1 2015. Santos, Dennis, and Anthony Allada. “Witness Absence Making Vigilante Killings Hard to Solve, Says CHR Exec.” Philippine Daily Inquirer, September 29 2003. Tupas, Jeffrey. “Duterte Gives up City Police Control, Quits Napolcom Post.” Philippine Daily Inquirer, April 1 2009. Tupas, Jeffrey, and Dennis Santos. “2 Palparan Campaigners Found Dead.” Philippine Daily Inquirer, April 6 2010. ———. “Davao Farmer Leader Gunned Down.” Philippine Daily Inquirer, May 16 2008. “Who’s Afraid of General Palparan?”. Philippine Daily Inquirer, October 19 2005. “You Can Die Any Time: Death Squad Killings in Mindanao.” New York: Human Rights Watch, 2009. Zabriskie, Phil. “The Punisher.” Time Asia, June 24 2002. Sol Iglesias is a PhD candidate in Southeast Asian Studies at the National University of Singapore (NUS), studying patterns of political violence in the post-Marcos, democratic period of the Philippines. She has a MA in international affairs from the Fletcher School at Tufts University, MA in political science from NUS and BA in public administration from the University of the Philippines. Sol was the first Filipino, Asian, and woman to be Director for Intellectual Exchange at the Asia-Europe Foundation (2009 to 2012).